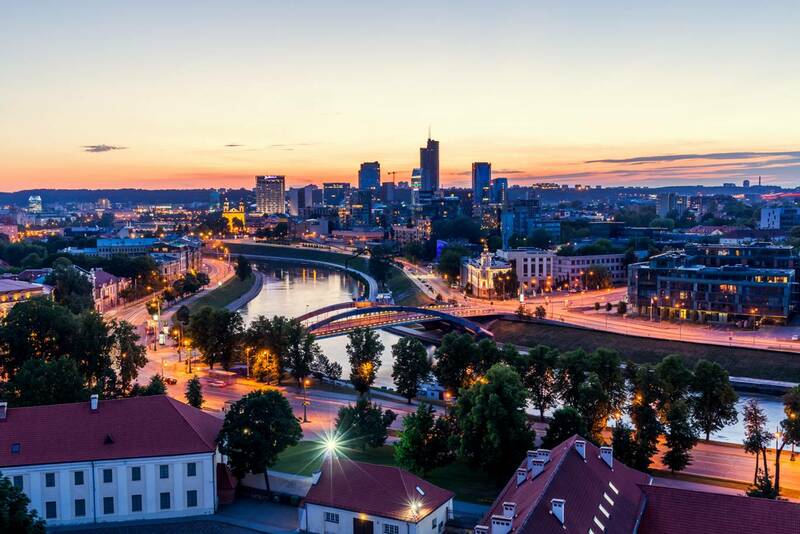 Vilnius, the Lithuanian capital, is a gem of boutique vintage shops, pocket-sized microbreweries and an historic old town characterised by cobblestone streets and baroque and neoclassical churches. Today, the city has a thriving arts and food scene, numerous museums and, in the tongue-in-cheek, self-declared Republic of Uzupis, a healthy sense of the absurd. 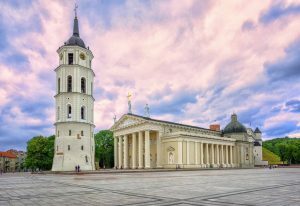 Urban Adventures’ Made in Vilnius tour provides insight into the city’s history, culture and culinary fare. 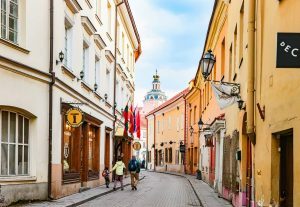 Sights include a walk along Stikliu street, popular for glassware, and Hales market, a traditional food market that’s the place to go for smoked meats, fresh coffee and Lithuanian cheese. The goat’s cheese from Roots is also superb. In the warmer months, the beautiful gardens at the Presidential Palace are open to the public. However, with a history dating back to 1387, the palace itself is worth visiting, its ornate interiors laden with historical significance. Tours of the palace are free, but only take place on Fridays at 4.30pm and Saturdays from 9am-2.30pm. The Three Crosses monument in Kalnai Park boasts some of the best views in the city and, despite its proximity to the old town, has the atmosphere of a countryside escape. Nearby Stalo kalnas (Table Hill) is popular for barbecues and bonfires in the summer months. One of the few hilly parts of the city, it’s ideal for a bracing, early morning walk, particularly in spring when the violets start to bloom. The self-declared “republic” of Uzupis is a lot closer to art lover’s heaven Metelkova in Slovenia than it is Denmark’s politically charged Freetown Christiania. Perched on the fringes of the old town, the district is home to a number of restaurants, hole-in-the-wall pubs like Spunka and unique art installations which sit on the banks of the River Vilnia. 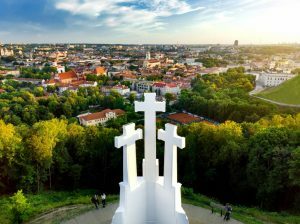 Take a stroll up to Vilnius St Bartholomew the Apostle Church and you’ll discover fantastic views over the city, the sky dotted with hot air balloons during the summer. For a city of its size, Vilnius boasts a huge number of museums. One of the most poignant is the Museum of Occupations and Freedom Fights. Housed in the former headquarters of the communist-era KGB, it details the crimes of the previous regime with startling candour. Alternatively, head to the Vilnius Academy of Arts to visit Titanikas, a free exhibit of contemporary art. Artis Centrum Hotel is ideally located in the city’s old town, right next to the Presidential Palace. Rooms are spacious and comfortable and facilities include a sauna and swimming pool that open in the early morning and again in the afternoon. Doubles from €80 (£71), B&B. 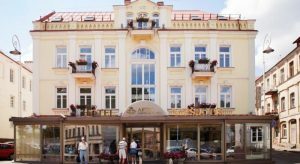 Shakespeare Boutique Hotel Vilnius is a stone’s throw from both Uzupis and the cathedral, located in a baroque building at the heart of the old town. Each room is named after a famous cultural or historical figure. Doubles from €120, B&B. With a commitment to native, seasonal ingredients, Sweet Root is one of the best restaurants in the city. 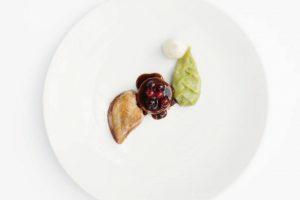 Its three-hour dining experience serves up portions that are sparse but immaculately presented, and guests receive a “scorecard” to tick off each ingredient served as the evening progresses. 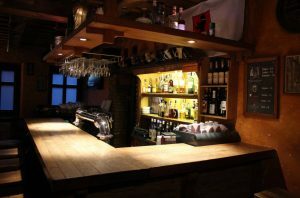 For a more traditional experience, Mykolo 4 is a small, family-run restaurant in the old town with an excellent range of Italian and French wines. Meat Lovers is an altogether more hefty affair, with steak, ribs and burgers, while Keule Ruke, close to the train station, is a hipster’s paradise, with provocative street art and a laid-back, outdoor seating area. The story behind the naming of microbrewery Busi Trecias is as interesting as the flavours of its homemade craft beers, but you’ll have to ask its young manager to tell the story. If you’re lucky, his father will sit down to chat with you too – as he doesn’t speak a word of English, it’s likely that you’ll bond over a shot instead. Snekutis is one of the most legendary pubs in the city; its charismatic, heavily bearded owner Valentas Vaskevicius can still be found behind the taps from time to time. For hot drinks and vegan snacks, check out Chaika, or head to bakery Kmynine for superior coffee. Vilnius isn’t short on shops. The larger shopping centres are located in the new city, while the centre is better known for its amber, glassware and arts and craft shops. Veer slightly away from the historic old town and you’ll find the most interesting places. Smells Like Spells is a boutique in the city centre where you’ll find candles, incense and perfumes made with natural ingredients, while Sirena, right next door, makes elegant, handmade leather bags. For natural arts, crafts and health foods, try siMona on Sventasis Stepono gatve (St Stephen’s street). It may get crowded, but the Cathedral Basilica of St Stanislaus and St Ladislaus of Vilnius, better known as Vilnius Cathedral, is gorgeous, with historic frescos and elegant facades. Lithuanian. English is fairly well spoken, particularly among the younger generation. Tipping of around 10 per cent is generally expected. 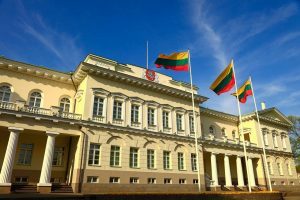 Vilnius has large and ornate Christmas markets in December, but the city really comes to life in the spring and summer when locals enjoy walking in its parks, or relaxing by the Vilnia. It’s easy to get around Vilnius on foot, but the city has a strong trolley and bus service, with 30-minute tickets priced at €0.65. The Three Crosses monument in Kalnai Park, with views over Vilnius old town. Nodding when your waiter takes payment in restaurants can give the impression that you’re happy for them to keep the change. Simply say “thank you”. Try to have some change on you, as staff are more likely to keep the tips this way.